The state sued Living Essentials seeking injunctive and declaratory relief under Washington’s Consumer Protection Act. While the court found that some of the challenged 5-Hour Energy claims had not been shown to be unsubstantiated (specifically, claims that the vitamins in the product offered benefits and that the product wouldn’t cause a sugar crash), the court found violations of the CPA relating to claims that (1) 5-Hour Energy lasts longer than a cup of coffee because of the synergistic or interactive effects of caffeine, B vitamins and nutrients in the product; (2) Decaf 5-Hour Energy would provide energy, alertness and focus that lasts for hours; and (3) doctors recommended 5-Hour Energy. Vitamin claims included the tag lines “B Vitamins for Energy; Amino Acids Focus & Better Mood.” The ads expressly claimed that the vitamins and nutrients in 5-Hour Energy played a role in providing energy, alertness and focus and worked synergistically with caffeine to make the biochemical or physiological effects last longer than caffeine alone. The court found that Living Essentials didn’t downplay or minimize the effects of caffeine. Rather, Living Essentials claimed that the duration of the recognized physiological benefits of caffeine would be extended because of the non-caffeine ingredients in 5-Hour Energy. In addition, Living Essentials introduced a decaf version, marketing it with a press release claiming that the decaf product provides “a sustained energy boost” for people sensitive to caffeine. The Living Essentials website claimed that Decaf 5-Hour Energy “gently” works to provide alertness, which it attributes to the presence of choline. These were objective claims about physiological benefits. Does your energy drink make you crash? sugar and caffeine are to blame! Finally, Living Essentials created an “Ask Your Doctor” ad campaign. 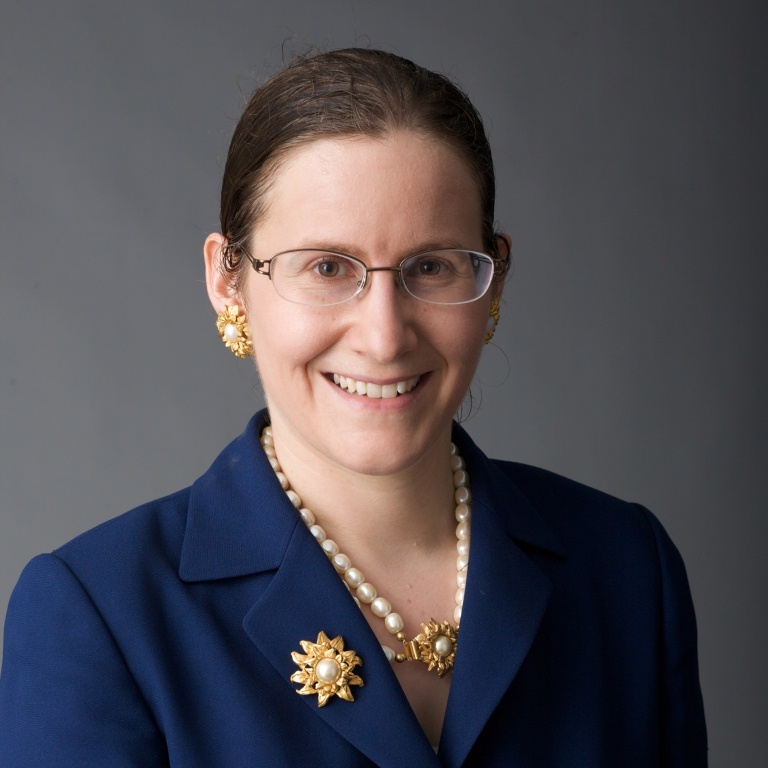 Living Essentials retained Thomas Maronick, Ph.D., a professor of marketing at Towson University in Maryland and the former Director of Impact Evaluation in the Bureau of Consumer Protection at the FTC to create an online survey of 503 physicians. Instead of asking doctors their general opinions about energy drinks/supplements, the survey asked whether they’d recommend a low calorie/low sodium energy drink for patients who already consumed such products. “Not surprisingly, the majority of doctors said ‘Yes’”—73.6%, to be exact. The survey also showed respondents a 5-Hour Energy label and a brief description of the product, and asked them if they would recommend 5-Hour Energy to their healthy patients who use energy drinks; 47.7% of the doctors said yes, while about 25% said no. We asked over 3,000 doctors to review 5-Hour Energy. And what they said was amazing. 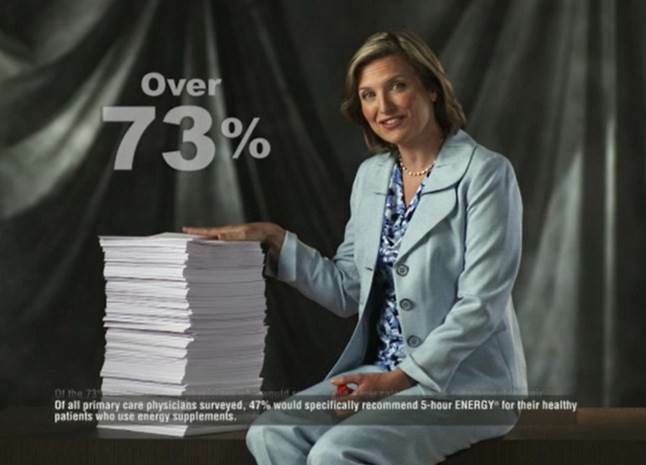 Over 73 percent who reviewed 5-Hour Energy said they would recommend a low calorie energy supplement to their healthy patients who use energy supplements. Seventy-three percent. 5-Hour Energy has four calories and it’s used over nine million times a week. Is 5-Hour Energy right for you? Ask your doctor. We already asked 3,000. Placed next to the ad spokeswoman was a large stack of papers, which she flipped through or gestured to while speaking. 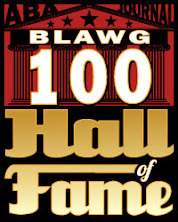 ABC and NBC refused to run the ads without some changes, and consumers also complained. 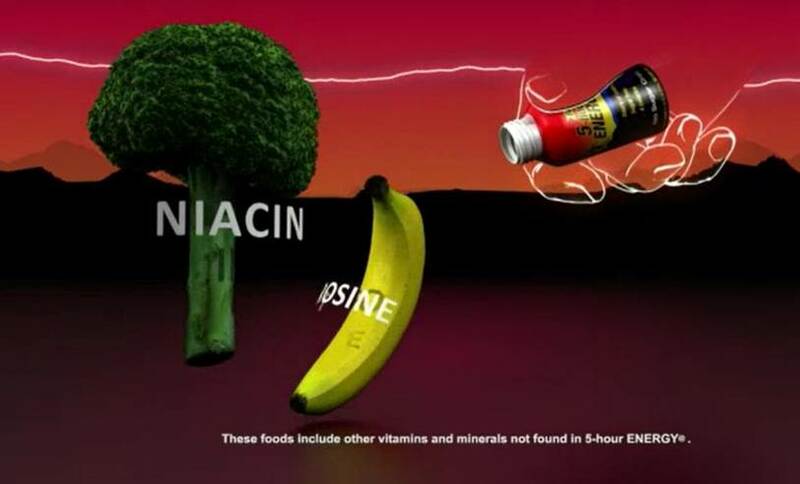 The court considered evidence about the effects of the various ingredients, including evidence developed after the ads aired, which could “shed light on pre-claim studies” used to substantiate claims. The state argued that caffeine was the sole active ingredient in 5-Hour Energy, in the sense of having a physiological effect on the human body. The court disagreed, because B vitamins, taurine, tyrosine and choline are bioactive. 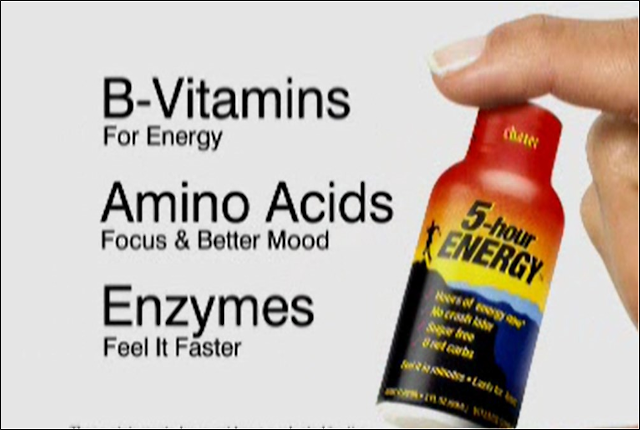 However, that didn’t mean that these bioactive ingredients, in the amounts found in 5-Hour Energy, would provide the advertised benefits of “energy, alertness, and focus.” There was disagreement among the experts about whether healthy, well-nourished adults could benefit from the vitamins and amino acids or whether they’d simply be excreted. The court found that the state hadn’t shown there was no benefit whatsoever from these ingredients. However, the state did show that claims that the other ingredients had a synergistic effect with caffeine for the promised benefits of “energy, alertness and focus” were unsubstantiated; the evidence Living Essentials offered was incapable of distinguishing the effects of caffeine from the overall effects of the product. Likewise, the study of the decaf product was insufficiently reliable to substantiate Living Essentials’ claims. Living Essentials presented evidence that it complied with industry standards in substantiating its ad claims, first, by having its advertising director conduct internet research on the formula’s ingredients, then by instituting a process for legal and regulatory review by an outside law firm, followed by retaining others to perform literature reviews, and finally by commissioning clinical studies. The advertising director’s internet research was not adequate substantiation because he “had no ability or training to assess the scientific reliability of anything he read online.” Nor was regulatory or legal review reasonable substantiation. “There is simply no evidence in the record that anyone with any science training ever assessed the ad claims and the science backing up those claims against the FTC substantiation guidelines.” Nor was there any evidence that anyone in the company ever looked at the literature reviews. Living Essentials did act reasonably in undertaking clinical studies, but the key question was whether the studies were adequate to support the ads’ claims. The company intentionally promoted the product’s ingredients as changing the way the body functioned. It promoted the product as a healthy way to achieve these physiological results. 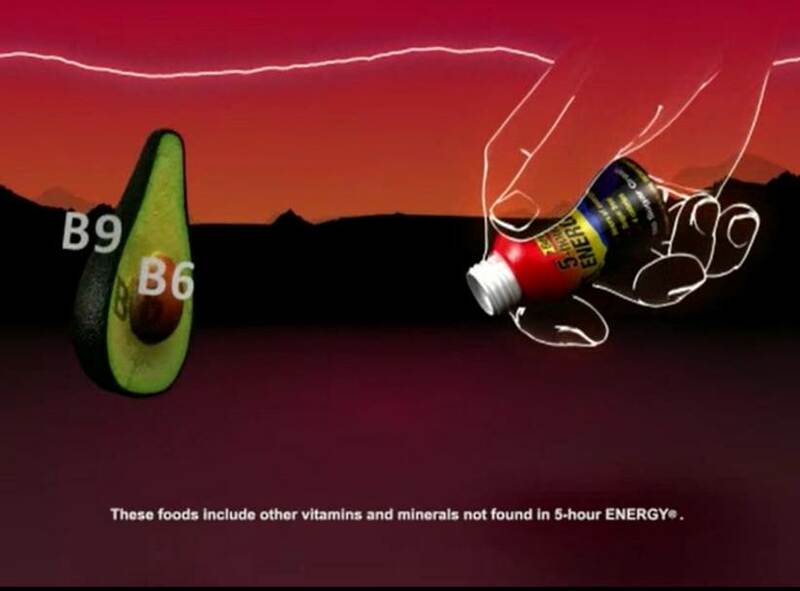 The company spent a significant amount of money on clinical studies to establish that 5-Hour Energy was having a biochemical or physiological effect on the bodies of its consumers. As Dr. Beale admitted, if an advertiser claims that a product will change or affect the physiological functioning of the body, that is an objective claim for which scientific substantiation [can] exist. The FTC also tells advertisers not to cherry-pick studies and to ensure that studies are relevant to the claims made in ads, including consideration of the dosage and formulation of the advertised product compared to what was studied. Under this standard, Living Essentials’ claims that that B vitamins promote energy and amino acids promote alertness and focus were not deceptive. However, it was deceptive to claim that these ingredients worked synergistically with caffeine to enhance caffeine-derived energy, alertness, and focus. None of the studies Living Essentials submitted reliably tested that question. Likewise, the decaf ads were deceptive in claiming that the decaf product would generate energy and alertness that “lasts for hours.” Living Essentials’ substantiation relied on studies involving daily dietary supplementation of taurine in 3000 mg or more; Decaf 5-Hour Energy contains only 483 mg of taurine. And studies of the actual product didn’t show significant benefits at the 3-hour mark. The “no crash” claims were ok, though, because Living Essentials switched to specifying “sugar crash,” and there was no empirical evidence of caffeine-related crashes in habituated users. Another problem was that the 73% claim in the ad was based on the online survey of 503 doctors, but the reference to “3,000 doctors” was a combination of both surveys. The survey methods used for the online survey and the paper survey “differed so dramatically that the surveys could not reasonably be combined and represented as the same survey.” The doctors who participated in the paper survey weren’t randomly selected.